Nowadays the first step towards the creation of a new bathroom starts with the internet. Apart from offering a good overview of the varied offerings, the web provides a wealth of ideas and inspirations. 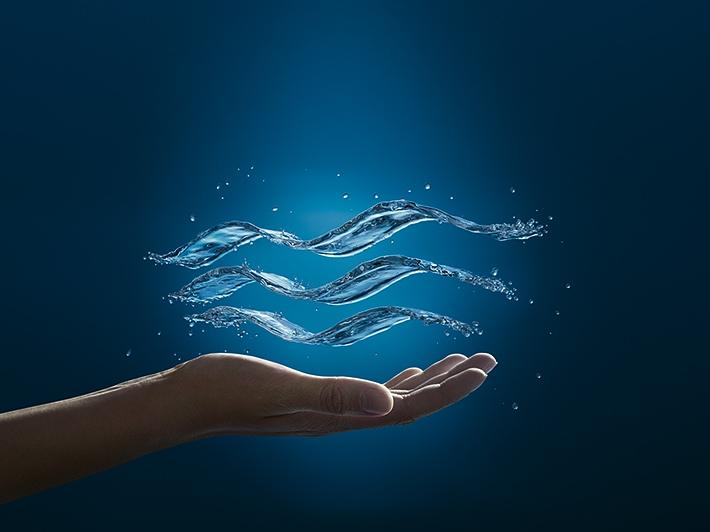 The newly relaunched GROHE website supports customers all the way. Its new functionalities are based on responsive web design technologies and optimised search functions. Attractively designed product pages with large image galleries inspire users to create and update their own bathrooms. 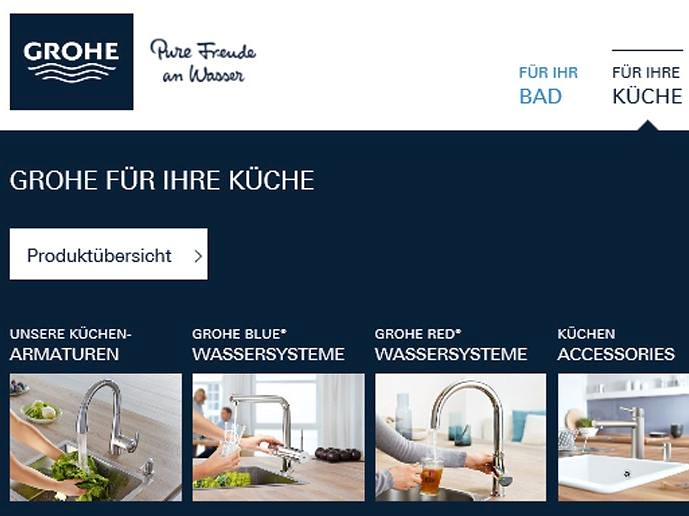 Whether used at home or on the road, whether viewed on a PC, tablet computer or smartphone, responsive web design ensures that the new GROHE website automatically adjusts to the user’s needs and screen size. The site can be accessed using any mobile device and always presents the best display. All desired information is easy to find and content is presented in a clear and uncluttered format. This allows consumers, for instance, to show their installer what faucets and fittings they would like to have in their bathroom and they can draw inspiration from GROHE wherever and whenever they please. To guide users to the right products as quickly and directly as possible, products have been grouped into two instantly recognisable categories, namely “For your bathroom” and “For your kitchen”. Clicking on either category takes the user to a sub-menu where they can choose a specific application area such as “wash basins”, “bath tubs”, “showers” and “WCs”. Suitable products are displayed in clearly structured arrangements, with convenient filter categories such as “product group”, “product line”, “installation type”, “kind of spout” and “colour” allowing to narrow down the search result. The text search function has been thoroughly redesigned for the benefit of users who prefer to search for a specific product by name or keyword. The autocomplete function means that you only need to enter the first few letters of a search term; the system instantly proposes a number of possible search terms and offers to take you directly to the respective pages. A convenient Notepad function allows to assemble all favourites and to download them in the form of a neatly arranged PDF catalogue. The introductory pages preceding the individual product collections have been redesigned as well. Aesthetic image galleries provide inspiration for modern bathroom design with GROHE faucets and fittings. A picture bar crosslinks to relevant articles and displays similar products as possible alternatives. 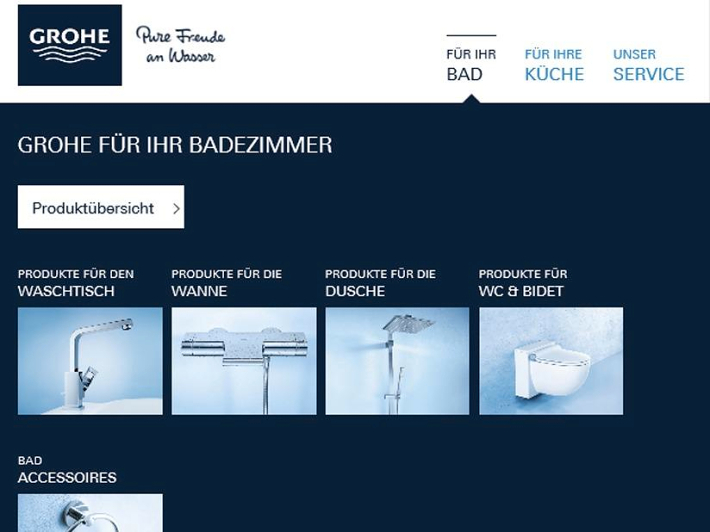 The new GROHE website has been revamped to give visitors an improved brand experience through more user-friendly functions and streamlined navigation. Throughout the site, information is made available where and when it is actually needed. In addition, the simplified showroom locator means that all details on the nearest showroom displaying GROHE products are only a few clicks away. The GROHE website for professionals will soon be updated and improved along these lines as well. 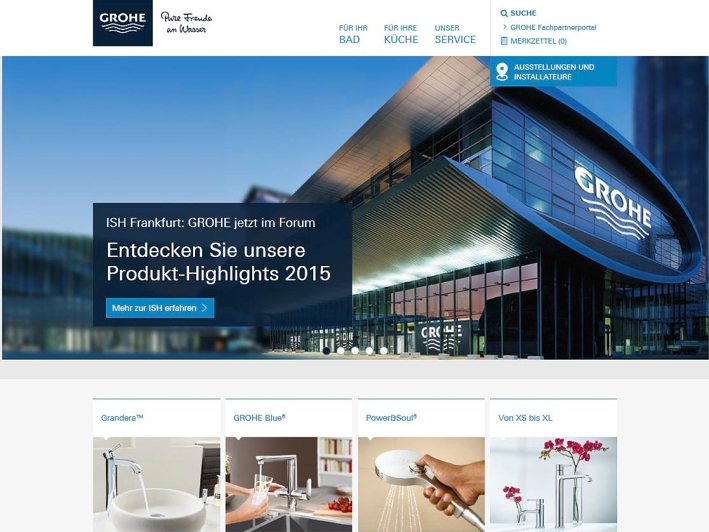 Clear design, intuitive navigation and relevant information – welcome to the new GROHE web site.